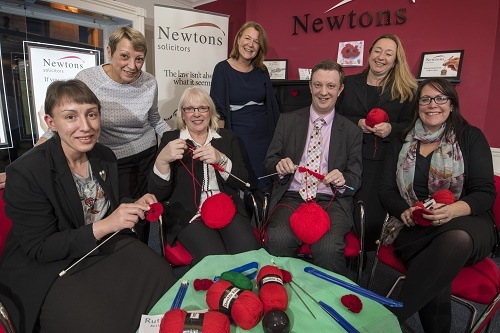 The law firm hosted an evening with 20 people from local businesses, from gift shops to butchers and architects to estate agents, to come and knit with the Newtons staff as part of a local initiative to knit 35,000 poppies. The poppies will line the parade route through the city from Spa Gardens to the Cathedral to commemorate the centenary of the end of the Great War. A band of knitters – right across Ripon – is hard at work and the initiative, coordinated by Councillor Stuart Martin, is gathering support from the community. Newtons is delighted to be an official distributor of the wool for the poppies and a collection point. The law firm is welcoming everyone to pick up their supply of wool from their office on Kirkgate and drop off their finished poppies too. In fact, the idea of the event has been so popular, that Newtons may host further evenings to continue with the preparations. Opportunities like these are a positive way of helping businesses join together, as Ripon prepares to honour those who lost their lives in the First World War.